CAGEF contributes to undergraduate and graduate student experiences at the University of Toronto through active involvement in courses and collaborative programs. This is an intensive and rigorous laboratory course that will teach students how to produce and analyze data that are central to the fields of genomics and proteomics. The course is divided into three modules, the first of which focuses on genomics, the second on transcriptomics, and the third on proteomics. Each module begins with at least two wet labs where students generate data and end with computer labs where students analyze the data. In this way students will learn how to conduct an experiment from beginning to end. Techniques taught include DNA and RNA extraction, shotgun library construction, PCR, DNA sequencing, expression profiling using microarrays, 2D-gel proteome analysis, mass spectrometry and associated bioinformatics analyses such as sequence analysis and assembly, and statistical analysis of microarray and mass spectrometry data. 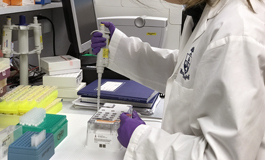 This is an advanced laboratory and computer-based course, and assumes a strong background in molecular genetics and some prior laboratory experience. It is most appropriate for students wishing to pursue careers involving biological research. CAGEF actively sponsors a range of student activities and external organizations. Outreach programs focus on increasing CAGEF brand awareness within the greater scientific community by maintaining a presence both within the University of Toronto and at relevant national and international conferences.